Normally I would talk about the Penguins getting ready to face the New York Islanders and how the Pens probably need the two points up for grabs tonight. But my attention will be to the grand ole Igloo. 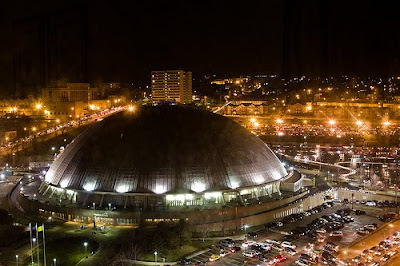 Once the Consol Energy Center was announced you all started to think of all the great times at the Igloo. We held our own Mellon Memories contest, receiving emails from all walks of life talking about the greatness of Mellon Arena. You can read a few of the entries here. Last pregame I talked about my dad taking me to my first game at the Igloo, we lost 8-0 to the Caps. Over the last 15 years I have tried to go to at least one game a year. Last season was one of the best. Scoring free tickets from my cousins mother in law we sat in the F balcony for game one versus the Hurricanes. Taking my cousins wife to the game was humorous, she grew up in Texas far from any hockey. When Fleury robbed Eric Staal early in the game chants of FLEURY, FLEURY, FLEURY echoed in the arena she asked You all like this guy don't you. The best part of the game was seeing 17,132 stand up in unison to see Miro Satan score on a breakaway. So many great memories, and hopefully this playoffs, the Cup will be hoisted by the Pens at home to close the doors on an old friend. 1.) Honor the Mellon - then play your hearts out.